Greetings Sponsors,Recently my husband Vic and I ventured to Bali for a bit of R&R and to catch up with the AAS Bali committee and coordinators. We are always amazed at the commitment of our volunteer crew in Bali and would like to share some of those happenings with you.There was a casual get together at Wayan Tur’s house (AAS Bali Vice President) for his birthday on the 9th August and several coordinators, associated Principals and friends joined the festivities. We visited SD2 Kutuh and met again with the sponsored children. Oka Darmaja is the new coordinator for this school (as well as SD7 Benoa where he teaches) and has replaced Putu Warasini who was promoted and transferred. Many thanks to Lucy Sawkins and family and Levi’s Gift Foundation for the donation of funds to instal a new computer and wifi system at the school. The new Principal Gede Rina is very pleased to continue the association with AAS and proud to announce that SDKutuh was the Bali winner of the Library Competition. The new Homework Club has commenced at SD2 Kutuh to assist the children whose parents are illiterate. We also visited SMPN4 Kuta Selatan and were very surprised at the amount of additions and renovations made to accommodate the huge influx of children to the school. This school, new 6 years ago, has had some wonderful achievements in a short time. We ventured to Pandek Gede to visit Dharma Ambesa and his family, accompanied by Brian and Sue Appleyard, long time sponsors, where we met with many of the new sponsorship children and their Mothers. We also met the Principal of the school where many of our new sponsored children attend, Mr Gede Sudama. Gayus is the recipient of the Milner International College of English Scholarship and will arrive in Perth on the 9th October for five weeks at Milner and then one week at Endeavour Primary School, which is the sister school to SD24 Pemecutan where Gayus is the English Teacher. He returns to Bali on 21st November. Sunday saw us off to Negara to deliver a bike to a very excited Iluh Putu Listia Dewi, who lives with an older brother since her parents both passed away. She will need to ride about 7kms each way to Junior High School soon. Iluh kept saying, “But it is new”. A big thank you to Mrs Rennick for the donation of the bike for Iluh. Thank you to Ketut Iga for sourcing, purchasing and delivering the bike and to coordinator, Gede Sudarmadiasa for the lovely morning tea with his Mum and Dad and Vic’s soccer game with his boys. Monday 17th August was Independence Day in Indonesia. Red and white flags adorn houses, buildings and streets. There are ‘Flag Ceremonies’ at all the schools, most businesses and Government Departments. School children practise marching and drills for some weeks before the day. Vic and I attended the ceremony at the Risata Hotel. It was presented and attended by many of the staff. Children of staff who had attained a ranking of 1, 2 or 3 at school in the end of year exams were invited to join the ceremony, at which they were presented by the CEO, Antik Mugianto, with a monetary award, books and a new school bag before enjoying a breakfast with their parents. We visited SMP4 Kediri to present the ‘Anne Rennick Scholarship for six years of high school to Ni Komang Tri Citradewi and caught up with Ni Kadek Dian Saraswati, recipient of last years ‘Grattan Scholarship and the other sponsored children. Thanks to Alit Widia for making the arrangements and to the new coordinator at SMPN4 Kediri, Wayan Sekarini for her assistance. Next it was on to SDN4 Kaba Kaba where we inspected the ‘Aveley English Centre’ and met with the Principal and staff, after which we moved to SDN1 Kaba Kaba. Both these schools provided a digital record of AAS coordinators and parents and children’s visits from their sister schools. Again we met the sponsored children. It is wonderful to see them looking healthy and to hear they are achieving well at school. We were able to deliver new school clothes, (hats, shorts, Tshirts, skirts, skorts) donated by Morley Primary School to be distributed to local schools and families. Thank you Alit and Made for facilitating all of this and for the lovely cake and afternoon tea. A big ‘Thank You’ to Morley Primary School. I understand that some of the larger wide brimmed hats have been donated to the Senior Citizens Club for use on their Friday aerobics sessions. Alit Widia is involved in the Senior Citizens Club, which is currently endeavouring to raise funds to take the Senior’s on a bus trip to visit some of their Traditional Temples. On the way to Lovina we caught up with Ketut, the Principal of SD3 Rianggede and his wife Tini. They had a most enjoyable visit to their sister school, Riverside Educational Support Centre in Mandurah in June. Thank you to the staff and Principal Jim Douglas, who ensured the visit was informative, relaxed and so enjoyable for the visitors from Bali. It will long be remembered. Again, another delicious lunch. Once we arrived in the North of the island we visited the Singaraja Hospital. Komang Budi’s wife, Komang, who assists him both for his needs and in the business, had a stroke a week before and her right side has been compromised. Signs of partial recovery were evident. She had some movement in her right hand, she could speak a little but her leg was still paralysed. The next day we visited Budi at home and he was hard at work with members of his family assisting to complete a consignment for delivery the next day. It will be some time before the extent of Komang’s disability is known but Budi’s family said they would all help. Budi, with assistance, was tie dying and painting traditional patterns on sarongs and intended to work through the night to have the consignment ready on time. On the way cutting across from Rianggede to Baturiti, we fortunately took a wrong turn and saw this. We met up with Leonie, the daughter of one of our other sponsors and visited the student Hendra and his mother, at Ketut and Yuni’s house once more. Yuni had purchased shoes, socks, bag, telephone, dictionary and thongs with Hendra on behalf of his sponsor. Another delicious meal. It was a very happy occasion. We went to Marga and with our coordinator, Ketut Widana visited the home of one of Mrs Beeson’s sponsored children. Nandi is unable to walk and relies on his wheelchair or moves around on his hands and knees. Nandi’s sister, Nadya is also sponsored and the two children are very close siblings. They live with Mum, Granma and an older sister. Nandi was 9 years old before he was able to go to school so is a little behind in his schooling. Hopefully he will commence at an SMP (Special School) in the near future. On the way back we stopped to catch up with Sri Agustini, the AAS Treasurer. Sri is expecting her third baby and works full time in the Education Department as well as being a volunteer with AAS. How does she do it all? We saw different things on the way back. In addition we met with Coordinators Anief Arzuani Adhar (Pecatu), Wayan Suadra (Baturiti), Agung Sumanadi (Pelaga and Petang), Agung Putra (Mas, Ubud). Thank you all for the hard work you contribute to make AAS such a success in Bali. We ran into Made Wijana at the Bedugal markets. Made visited Perth with one of the Principals study tours some years ago. We visited Stikes Nursing Academy and the Dwi Jendra University in Denpasar. This campus caters for children from Kindergarten, Elementary, Junior High, Senior High and University. The five Faculties in University are Education, Law, Agriculture, Business and Religion. Staff at the University has produced a computer programme to add to ‘Fonts’ on the computer. It converts other languages to Balinese (not Indonesian) written language. It looks very much like Sanskrit and is very difficult to learn. We were given a demonstration and a DVD programme to ‘have a go’. This is a non-smoking campus and signs warn of huge fines if anyone is caught smoking – that is all staff and students alike. We were able to catch up with sponsors from Victoria who were in Bali and will visit their sponsored children in the next week or so. Have a good time Lyn, Gary, Eric, Bianca and Helen. Of course we had the odd swim in our pool and the water is much cooller and enjoyable than in February when it is so warm. Thanks to the Risata Resort for the counter collection on behalf of AAS. The donations this year will ensure another elementary child has funding. August 19th saw us enjoy dinner with Ketut, Yuni,and their children Vicky and Adinda, Wayan Tur and his wife Julie and Gede Sudarmadiasa at the Bale Udang Restaurant. Not only did we enjoy a wonderful meal but had much fun and laughter. Many thanks to my friends and to Gede for the lovely Black Forest cake. One of the last meetings we had was as SMAN1 Kuta where discussions were held about the students study tour for Harmony Week in March 2016. Nyoman Yasa the Principal has confirmed the group will visit and part of their programme will be to attend school for two days at Belmont City College. The students will visit tourist attractions such as Whiteman Park and Fremantle SMAN1 Kuta will host a group of West Australian Scouts in November. We returned to Perth at the end of August confident about the future of AAS in Bali due to the commitment of the coordinators and committee. Thank you to all the schools and sponsors who make this programme so viable. It is very rewarding to see children graduate from High School and University knowing that without financial support the majority of them would not have completed elementary school. 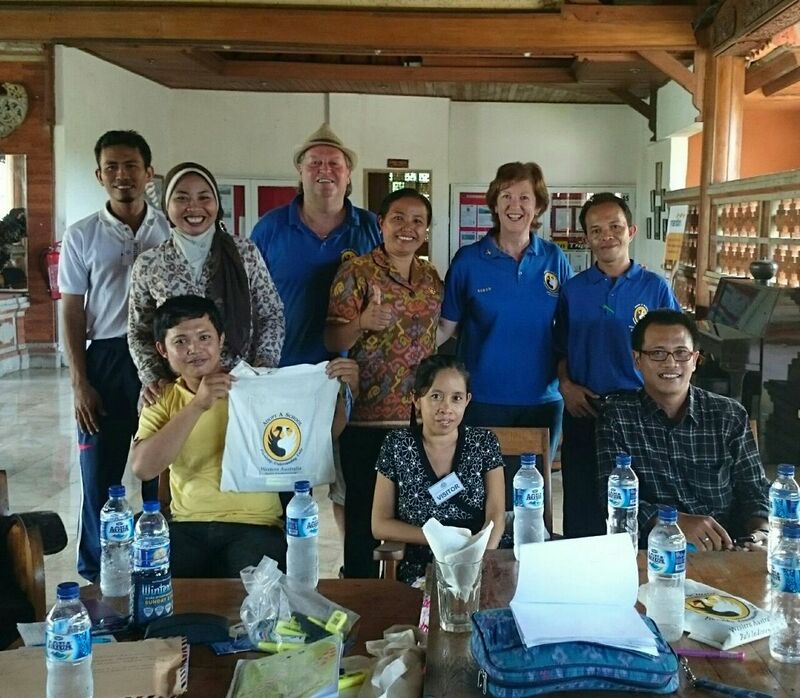 In January 2015, Susan Cromb (Membership Officer) conducted a workshop at Keraton Beach Hotel, Jimbaran, for new coordinators in the Kuta Selatan area. Jati and Gayus, both long-term coordinators for AAS, shared their experiences with the newcomers. When in Bali Sherryn and her friends from Canada, Terry and Gail had an opportunity to visit some Sister School Projects in some different villages: Kaba-Kaba, Nyambu, Cepaka and Munggu. Her visit could be a special one.That time she didn’t visit sponsored students,but some projects that funded by Sister Schools. She began her visit on Friday, 20 February 2015. In SD2 Munggu she officially began communicating with LeeAnn Hanson at Nowra Public School in Sydney, NSW by using a skype. The cost of internet and set up a skype was funded by the two schools.Now the communication between the two schools become easier as if Munggu – Sydney were near. They plan to communicate regularly every Friday. The Landsdale Primary school sent some money for SD2 Kaba-Kaba. The fund was spent for furnishing the school library needs i.e. TV-DVD, CURTAINS AND GRIFTING IRON for windows. Sherryn was honoured to switch on the TV to watch visitors that had a visit to this school before. In SD4 Kaba-Kaba Sherryn and groups were shown the CLEAN WATER project. The project was wholely funded by the Aveley Primary School. Now the students need not to take water from the old school well anymore. They can keep the toilet clean and the garden beautifully green. The last visit on that day was at SD1 Kaba-Kaba. Sherryn had opportunity to strike the RINDIK, a bamboo music instrument. Lyn and Gary Yeomans from Victoria donated some money for it. The next visit was on Friday, 27 February.Sherryn and groups continueing their visit to some other schools in Nyambu and Cepaka. SD1 Nyambu rebuilt the School Sign Board. The South Bunbury Primary School shared the cost of this project. Sherryn was asked to cut a ribbon and then open the cover of the board. It means that the new school sign board is officially used. Then we visited SD2 Nyambu. It is a Sister School of Morley Primary School. Again Sherryn was asked to unlock the School Iron Gate before entering in. We also saw the school guard demonstrate cutting grass in the school yard. Boy-students need not to bring sickles when they do the cleaning at school. We ended our visit at SD Cepaka. The School Committee renovated the school toilets. There are 3 toilets. A Western Style toilet is specially for guests and teachers and the other two are for girl-students and boy-students. The project was funded by the Bletchley Park Primary School. Sherryn has seen to the spots projects in every schools. I think she will send a report to every Sister schools in detail. The school principles always involving the school committees in every school activities.Your donations are really very useful. And the only words I can say is: THANK YOU VERY MUCH and KEEP IN TOUCH!